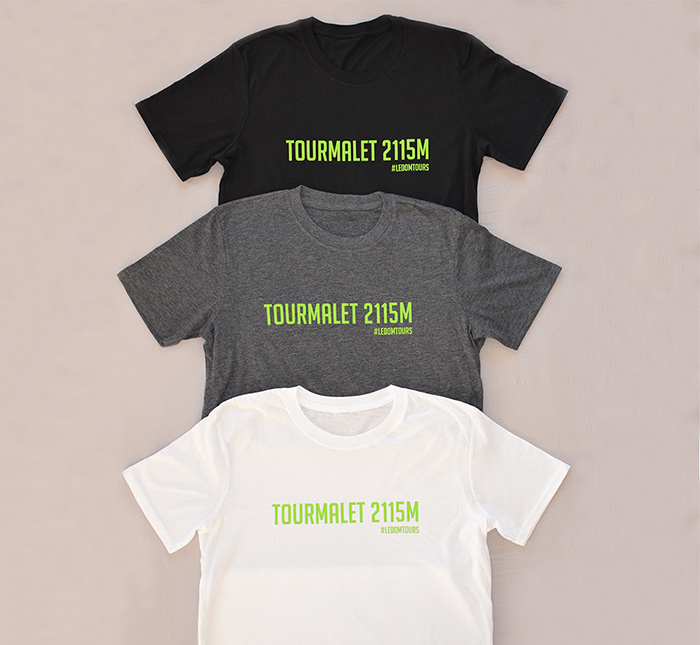 The Marmotte sportive is one of the best known annual assaults on the Alps, with cyclists tackling a 174.4km route while notching up in excess of 5000m of climbing via the Col du Glandon, Col du Telegraph, Col du Galibier and the most famous of them all, Alpe d’Huez. Conditions differ each year, yet this route stays constant, so how should one go about training for and riding such an event? Well that’s what I’ll attempt to answer here. 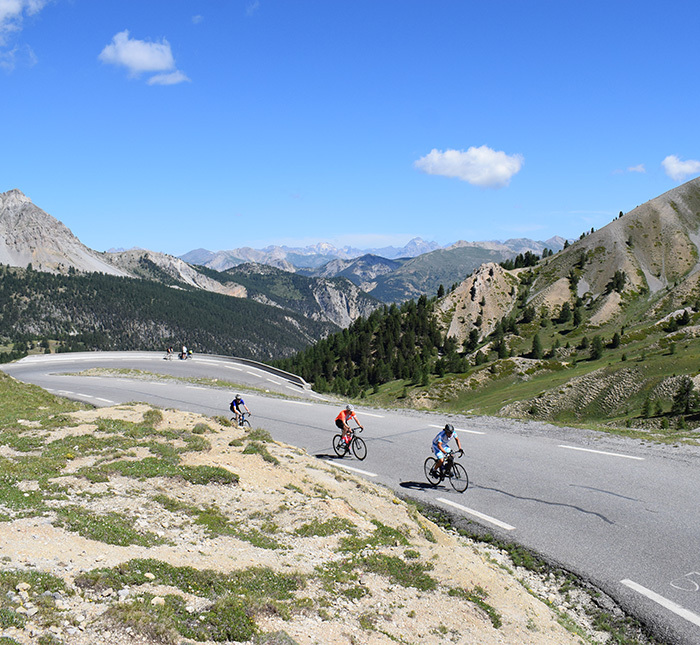 While this article is specifically geared towards the Marmotte as the route is fixed and can therefore be broken down into a useful yearly resource, the training advice below can be applied to any mountain sportive. In particular, with the strategy section below in mind, I would recommend that you dedicate an evening to breaking down the route of your chosen event, making particular note of the placement of the Cols within the route, the stats of the Cols, the location of any feed stations and whether you have a summit finish. With this information considered you will be able to develop a solid plan to follow on the day, while also focussing your training appropriately. Now whether you “just ride”, design your own training plans for yourself or even have a coach who plans sessions for you, the first step when working out your training is to set some goals. Do you just want to finish regardless of time, do you want to set a gold medal time or do you have another goal in mind? Working out your goal at this stage and assessing whether it is realistic (i.e. based on your experience level, time available to train etc etc), is vital, so ensure you do this before embarking on a training plan. I would also say at this stage that you shouldn’t think of a “training plan” as being a thing for the super keen riders only. Simply put, the more structure you can apply to your training, the more you will get out of it during your goal event. 1. Ability to out sprint your friends on a club run. 2. Ability to hold a high but steady power output for long periods. 3. Ability to drop your mates on one of your local climbs in the UK. So which one is most relevant to the Marmotte and the world of mountain sportive? I’d have a guess that a good number of you would guess at number 3, however I’m afraid that is not the case. 1. While it is great to out sprint your mates to the coffee shop, the mountains require measured efforts over the course of a full day in the saddle. In addition it is unlikely that you will need to launch a killer attack on the Galibier to gap the rider closest to you (much as you’d love to live out that TdF fantasy you are probably best off not doing it during the Marmotte). 2. Kerching, this is what we are looking for as I explain in detail below. 3. This certainly isn’t going to do you any harm, but I’m afraid your local 1km/19% hill doesn’t hold much comparison with the 21.3k climb of the Glandon (never mind what is to come later in the day), so short sharp hill efforts aren’t really going to cut the mustard. This is what we are really getting at with number two, i.e. your ability to hold a consistently high power output for long periods of time. This concept can be referred to as any of the above terms, with Tempo being a traditional term that you have likely heard the commentators use while watching the TdF, while FTP (functional threshold power) and threshold tend to be used by those who train with a power meter or by heart rate (from now on I’ll group this concept into the word “threshold” to save my word count). 1. ATP-CP – this energy system provides explosive maximal output for very short periods of time. It is rarely used in cycling, with the only real example of its predominant use being a standing start in a track event. 2. Anaerobic – this is predominantly used for high output, short duration (around 20 seconds to 2 mins) efforts. Waste products from the anaerobic system contribute to the acute “burn” feeling that you have no doubt experienced in your leg muscles causing you to slow down. This is the system you are predominantly taxing when you you go for point 3 above on those short steep climbs. 3. Aerobic – this is the predominant system used in endurance cycling and can in theory go on forever if enough fuel and oxygen are provided. There are no waste products from the aerobic system meaning that work doesn’t produce that burning feeling. This is the predominant system during endurance cycling. It is important to understand that these systems never work in isolation, however as endurance cyclists, the vast majority of our output is governed by the aerobic energy system. Threshold is therefore referring to the very top end of your aerobic energy system’s output, at the point just shy of the anaerobic system taking over the main body of work, as this is where the maximum output can be obtained with the minimum of time or waste product limitations of the other systems. So why the focus on threshold for the Marmotte and mountain sportive in general? Well, we know that the Marmotte climbs are an hour plus in length even for a highly competent rider, so we cannot rely on our anaerobic or ATP CP abilities to get us through. We can therefore equally determine that our aerobic system is going to be taking the vast majority of the workload and that we should therefore focus on ensuring this is as efficient as it can be, as this will maximise our power output. Threshold builds into this as being the highest output within that energy system, so it is this that we should seek to improve in order to maximise our speed for the least cost. Now unfortunately, raising one’s threshold is not an easy task that can be completed by banging out a series of short sharp intervals that leave you dying on the handlebars. Threshold is best raised by spending comparatively long periods of time at or close to it in training. You must therefore learn to embrace the concept of the long interval, with the infamous 2×20 being a core of this type of training. So the first 20 acts as your introduction, ending with you feeling taxed but within the realms of comfort. The 5 min spin allows you to recover some of your exertions, but isn’t sufficient for a full recovery, meaning you start the second 20 with a pre fatigued system. There’s no way around it, a 2×20 done properly will hurt and will leave you suffering, however it will work wonders for your threshold power when built into a programme focussed on such gains. In addition to the 2×20, sessions such as the 1×30, 2×30, 3×20 and so on can also be programmed to great effect. It is also possible to get some of the benefits of this type of session with a shorter interval, however anything below about 12 mins is going to be of less value in the mountains, where climbs can be several hours long. The other point to this type of training is that doing these sessions helps to build comfort with time on the bike at a relatively challenging output. The benefit here is that you will build up a level of mental and physical resiliance that will be of great help on the day of your event. Climbing the Glandon, Telegraph, Galibier and Alpe aside, the Marmotte is also an incredible long ride, with over 170km in the saddle. As a result, riders cannot afford to solely focus on threshold sessions, but must also make time for a weekly long ride in order to adapt to spending many hours in the saddle. This not only gives you a mental and training boost, it also readies your body (particularly your knees) for the challenge ahead. While of course life can get in the way, it is of paramount importance that you build up your ride distance over the winter, spring and early summer to ensure that you are working towards that goal distance. The sooner you start this process the better you will be come next July. Opinion is split on whether riding the full distance of any long distance event is wise, with opponents arguing that any good that comes out of such a ride is tempered by the additional recovery time required in the aftermath. It is also largely depends on the person, as some like to know that they can at least do the distance before hand even, if they can’t replicate the climbing. For me this is a personal choice and one which is fed into by your personal goals, but if you have the time available and are a suitable length of time out from the Marmotte, I believe completing the distance can give you a mental boost that will make all the difference on the day. Finally, if you cannot stomach solo riding or would like an intermediate goal to help keep you motivated over the winter, then sign up to some reliability rides, sportives or an early season training camp. Each option will help motivate you and you’ll find that your distance numbers accumulate very easily. Caution must be urged when entering into a new training programme and particularly when engaging in dedicated threshold sessions, as they are extremely taxing on your system and you therefore must ensure you build in adequate recovery time. For a fairly new or occasional rider, this may mean programming no more than one such session a week in the early stages, whereas an experienced rider may be able to get away with two or even three sessions a week. The best advice is to listen to your body and programme accordingly – don’t make the mistake of pushing too hard too early and risking injury. Equally, don’t expect miracles, your hard work will pay off, but it will take time. Building up mileage over the course of weeks is far better than jumping in at the deep end, so unless you have been riding regularly prior to signing up for the Marmotte, Etape or any other mountain sportive, don’t make the mistake of taking on too much at once. Increase the distance of your weekly long ride by no more than 5-10% a week and ensure that every month you back things off slightly to give your body a chance to recover. This leads on to my other major point which is that the Marmotte is many months away and in order to make any long term improvement (particularly in your threshold power), you need to build a series of weeks and months of consistent training. Slap dash weeks of six days off the bike followed by a really hard or long ride, will make achieving consistent gains very difficult and will do your motivation levels no good, so while it may be unavoidable at times, attempting to put together solid blocks of training is by far the best strategy. This is where a written training plan comes in to its own as you can record your progress alongside planning your sessions on the bike to ensure you are maximising your enjoyment and improvements. The written plan also has great benefits to motivation, making it far less easy to convince yourself not to ride on that Wednesday in January when you don’t quite fancy it. These thoughts are some way off at the moment, but huge gains on the day can be made by riding smart. Many riders will tear off up the valley road on route to the Glandon and use the flat section between it and the Telegraph as a pseudo time trial, but this strategy is likely to result in them blowing up not long after. Recognise the fact that those 174km will require you to withhold in the early and mid stages in order to finish, so by moderating your efforts early in the day you will leave enough in the tank for the latter stages. In addition, though I am by no means suggesting that you race down the descents, the masterclasses that we offer on our Mallorca training camps will provide you with the skills to descend safely and in a relaxed and comfortable fashion. This will ensure you aren’t wasting energy on the descents by being tense or scared, while also nudging up your average speed (which could prove vital towards the latter stages). Bourg to Glandon – find a group that are riding at an entirely comfortable pace for you and stick with them using the drafting effect to best use to shield you. Once on the Glandon ride at a pace that feels completely comfortable. You shouldn’t be anywhere close to full exertion at this point and should ensure your fluid and energy intake is high. Glandon descent – take it steady, being particularly careful on the initial narrow sections towards the top. Try to flow and avoid death gripping the handlebars and brakes as this will make the bike skittish and unpleasant to ride. Valley section to the base of the Telegraph – find a group riding steady and stick with them. This section can be tempting to race, but you’ll need that energy later on so take things steady and take on more energy and fluids. Base of the Telegraph to Col du Galibier – this is a long stretch and one in which you will likely begin to dig deep particularly as you near the higher slopes of the Galibier. Focus on holding a steady rhythm and accept the fact that you will be on this section for several hours. Ensuring your energy levels are topped up is vital as is avoiding dehydration if the weather is hot. Col du Galibier to Bourg – the upper sections are again technical, with the road widening as you lose height. Be particularly careful where the road rejoins the tunnel road as this corner can be a bottleneck. Use the following section to ensure your energy intake is high and your fluid intake is good. Be careful in the tunnels further down, being particularly careful to assess other riders around you as their mistakes may cause you to fall. The final valley road section to Bourg is straightforward (head wind notwithstanding) but again don’t overdo it. 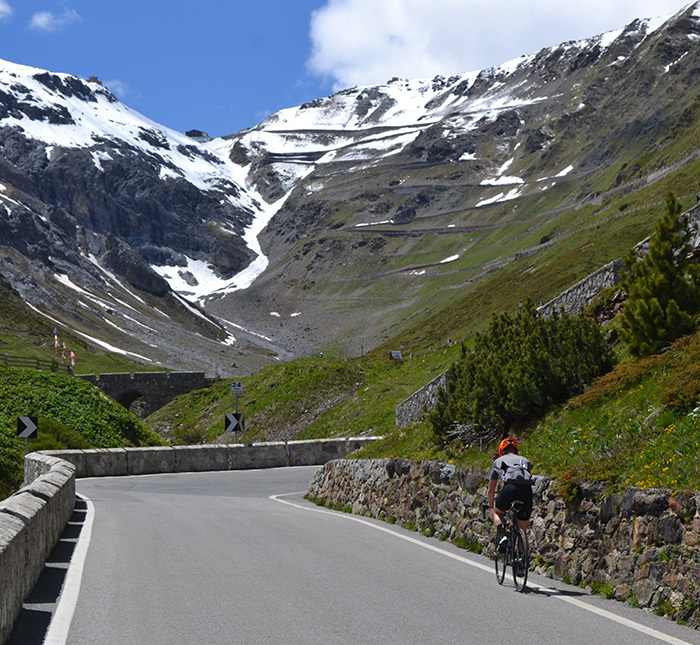 Bourg to Alpe d’Huez – by this point you will probably be calling up everything you have from the engine room, so just do your best to keep on turning the pedals. Though the temptation to stop may be extremely high, I would avoid doing so at all costs as it is incredibly difficult to get going again. Counting off the hairpins in your head helps to break down the climb into manageable chunks and the support on the hill should give you a much needed boost. Good article! And, indeed, useful advice. A great article. Thanks Rob.